Once you’ve used Serialtest, you will never want to work on another serial communication problem without it. Serialtest will help you quickly and easily find and fix even the most obscure problems and save countless hours of troubleshooting time. It is portable and easy-to-use with power and flexibility. No matter what the industry, Serialtest is an indispensable troubleshooting tool. Serialtest Async is a PC-based analyzer for passively monitoring or actively testing serial asynchronous (async) communication circuits and networked equipment, at speeds up to 921.6 Kbps. The product offers an economical solution for debugging, testing, and troubleshooting equipment, circuits and software applications on serial data communication networks. Typical test application areas include utility meter reading, railroad signal and switch monitoring, PC-based control, lottery and gaming, credit authorization, and the Internet. 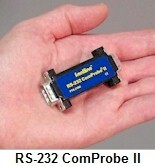 Works with RS-232 ComProbe II and RS-422/485 ComProbe (both plug into USB ports). Built-in decoders for Modbus RTU & ASCII, Async PPP, SLIP and TCP/IP. Capture & View data, control signals and error conditions live in real-time. Display Filters and Detailed decodes for rapid and easy analysis. Errors are highlighted to quickly spot problems. Software & Hardware Product Developers. The enhanced Serialtest protocol analyzer software enables shorter and less costly development intervals for data communication equipment and applications, faster and more efficient network installations, and improved mean-time-to-repair following equipment and network outages. The Serialtest Async product includes the respective ComProbes, the analyzer software, our DecoderScript decoder writing language and comprehensive product documentation. The RS-232 ComProbe II option also ships with a six-foot USB Cable, a RS-232 Y-Cable, and a Cable Bag to keep everything in. The Cable Bag is also shipped with the RS-422/485 ComProbe. Build your own custom decodes for proprietary protocols and extensions to existing protocol decoders using DecoderScript, Frontline's intuitive, high-level scripting language. Our DecoderScript Manual is a comprehensive guide to using the DecoderScript language and includes many examples of writing custom decoders. See our specifications page for more information about system requirements. Order your copy of Serialtest online.